TAMPA, Fla. — Kansas Secretary of State and Mitt Romney surrogate Kris Kobach compared LGBT people to drug users and polygamists while debating the GOP platform’s marriage equality language in Tampa on Tuesday. Kobach’s comments drew immediate criticism from the Human Rights Campaign. “Kris Kobach’s remarks are offensive and just the latest sign that the GOP platform is being influenced by people who certainly do not speak for the majority of Republicans,” said Fred Sainz, HRC Vice President of Communications. “It’s time for leaders within the GOP to take some responsibility and realize that their outdated platform – and the incendiary and vitriolic language used by some of their colleagues like Kris Kobach – sends a dangerous message and has a very real impact on the LGBT community, particularly youth,” said Sainz. Kobach, who is perhaps best known for using fear tactics to spread his anti-immigration agenda, employs similar tactics when it comes to matters of LGBT equality. 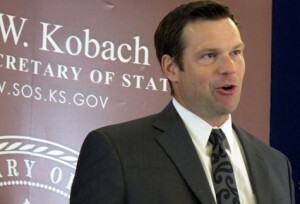 Kobach’s remarks come just one day after the GOP’s draft platform revealed that the Republican Party was continuing to ignore the mainstream values embraced by a majority of Americans and an increasing number of conservatives by doubling-down on its refusal to embrace marriage equality.